Baking with whole grains is easy. Whether you are looking for ragi cookies or nachini cookies, you will find it all here. After a successful attempt at baking badam atta cookies, I have given ragi (finger millet) a try. Here I have come up with ragi badaam (almond) cookies. 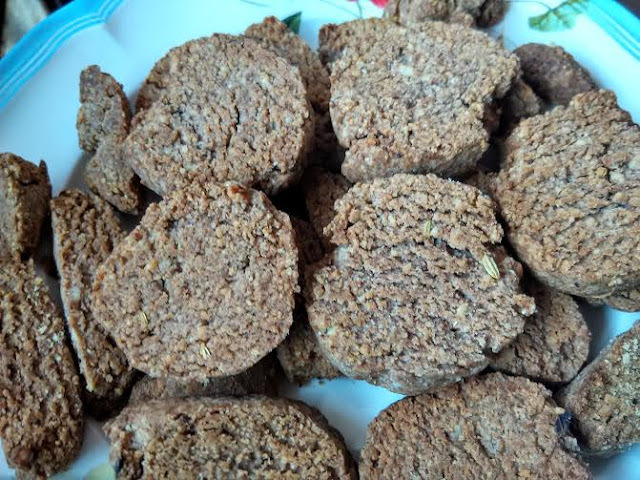 You may replace sugar and make ragi cookies with jaggery. This ragi cookie without butter recipe is surely going to please your body, mind, and soul, for the health benefits of nachini or ragi are explicit and the ragi biscuits taste yummy. The distinct flavor of ragi is certainly going to be addictive. I am already addicted to ragi, for its color, scent, and taste reminds of the quintessential muddy smell of the earth. Sieve wheat flour, ragi and baking powder. Next add sugar and almond powder. Mix oil, ghee, curd, and milk in a separate bowl. Use a whisker so that it gets fluffy. Do not knead. If the dough feels dry, add little more milk. Just gather the ingredients and make 2 or 3 logs. Refrigerate the logs for 3 hours. I refrigerated for the whole day. Preheat oven at 180 degrees for 8 mts. Cut the log into desired shapes. Grease a baking tray and place cookies at a distance from each other. Bake for 18-20 minutes at 180 degrees. Cool for half an hour on a cooling rack. 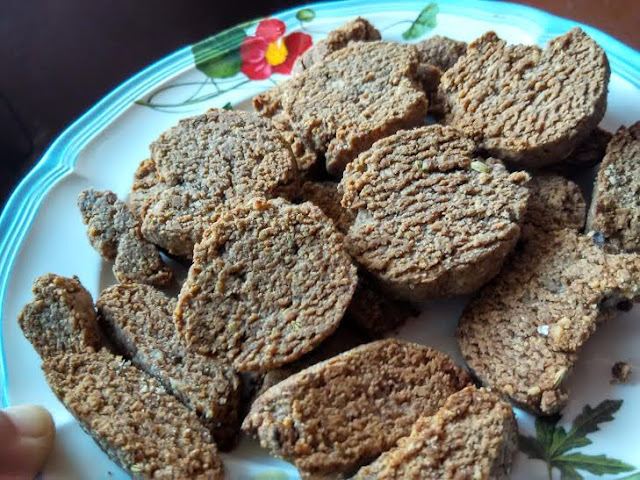 Enjoy this delicious home-made ragi almond cookies. You may want to check atta badaam cookies or pishta badaam cookies here.